Bathroom gutting tips are quite helpful for first timers. When it comes to home remodeling, there’s a lot which most people don’t know or fail to anticipate. Even if it’s for investment property rental home cleanout rehab, you should be in-the-know to avoid costly mistakes. Of course, any home improvement costs money upfront. And, it also requires a lot of elbow grease to get it done. That being the case, it’s necessary to ask if you’ll get a decent return-on-investment. Plus, if it’s good for resale (should you sell in the future). You’ll have to start with assessing the water heater. If it’s ready to go, seriously consider removing it. Be careful to do the water heater removal right so you don’t injure yourself with scalding water or get a serious electrical shock. If the water heater is 8 years old to 12 years old, it’s already at the average lifetime limit. Yet another consideration is about the condition of other bathrooms and spaces within the house itself. In other words, if other bathrooms also need updating, you can’t just redo one without redoing the others. When you’re ready to actually get to work, you should be totally confident in your home improvement skills. Be honest because it’s all too easy to get over your head in a very short amount of time. Shut off the water and electricity. Before you do anything, be sure to secure the power and turn off the water supply. This is dangerous work and especially so if you do not take precautionary steps. Take down all hanging decor. Any shelves, towel racks, and more must be removed from the walls prior to actually beginning the real work. Also, consider taking down wall-mounted mirrors and anything else attached to the walls. Remove the toilet. Though it’s not particularly enticing, you’ll probably need to remove the toilet. If you don’t know how to do this, call an experienced, licensed professional to disassemble and take out the toilet. Cover the tub and floors. 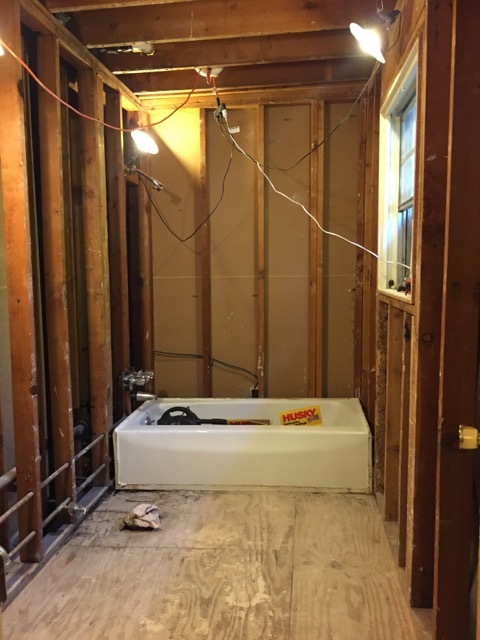 Next, take time to cover both the tub and the flooring so it isn’t accidentally damaged. Unless the tub and flooring are also being replaced, you should protect them. Disassemble and remove the vanity. Lastly, you need to take the vanity out of the space. Start with removing the doors and then the top. You might have to pull the sink out and then remove the top.